The project is located in the Roberts Creek community on the Sunshine Coast in British Columbia. It has been designed to serve initially as a part-time residence but will eventually be the full-time home of the client. The cabin is situated within a grouping of exposed granite bedrock in a clearing on the densely wooded site. 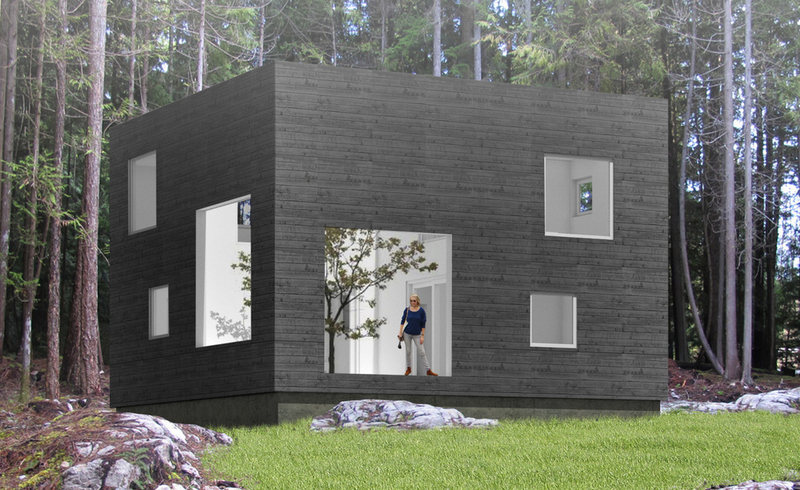 The compact 1536 sf cabin includes 2 bedrooms, 1.5 bathrooms, living area, kitchen and dining area, and courtyard. Driven in part by a modest construction budget, the project is designed around the idea of a four square grid and densely stacking the program on two floors. By doing so a highly efficient floor plan and building envelope and structure is achieved. In addition, the project's location on the site allows for a concrete stem wall foundation supported on the shallow, and partly exposed, granite bedrock. The project's simple planning and formal configuration is given complexity and porosity by a constellation of square windows. The placement of each window allows for visual penetrations through multiple spaces, thus connecting program elements to each other and to the landscape. Fundamental to the project's parti and relationship to the landscape is the courtyard that occupies one quadrant of the four square grid. The courtyard serves as a hybrid space between the wildness of the site and simplicity of the interior. A single tree and planter further reinforces this condition. From the courtyard the user is provided large framed views of the surrounding landscape, as well as views through the cabin, thus anchoring the project to its site. The materiality of the project is informed by the juxtaposition of the natural surroundings and minimal interior of the cabin. The exterior cladding utilizes the Japanese technique of shou-sugi-ban or charred wood siding. By evenly burning the wood (indigenous western red cedar) a dark char is achieved that provides a weather/decay resistant siding that is relatively maintenance free. This dark exterior is then contrasted by the white window frames and interior. The courtyard is clad in white painted fiber cement board to provide relative continuity with the interior surfaces.